one piece@be.smile SHINNEN Monochrome figures of Luffy, Chopper and Trafalgar Law. SHINNEN in Japanese means “belief”. The lower body can be replaced for sitting poses. The @be.smile series are figures where all the characters are smiling モノクロカラーのルフィー、チョッパーとローのフィギュアです。 下半身パーツも差し替えることができます！ @be.smileの特徴は「笑顔」です Check out one piece@be.smile NEGAI Looking for one piece@be.smile figures? 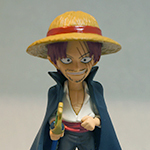 TV045- Shanks – World Collectable Figure Vol. 6 WCF Shanks – This is a figure of the younger handsome Shanks. He has both arms, and the straw hat really suits him!!! Really cool!!! ワールドコレクタブルフィギュア　vol.6 シャンクス 若いころのシャンクスです。両方の腕があって、麦わら帽子にとても似合う！！！カッコイイ！！！ Looking for WCF Shanks? 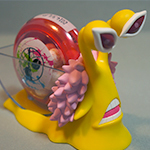 Doflamingo Dendenmushi @ 7-Eleven 7-Eleven is selling the e-ma (lozenge, aka throat sweets) Doflamingo Dendenmushi!!! Buru buru buru… Buru buru buru… e-maのど飴のドフラミンゴ電伝虫がセブンイレブンで販売しています！！！ ぶるぶるぶるぶる… Looking for Den Den Mushis? 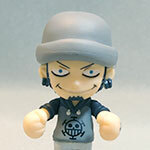 One Piece Mini Big Head Figure Vol. 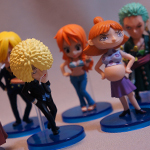 14 – Punk Hazard The figures in this set are: Luffy, Trafalgar Law, Smoker, Kinemon, Sanji in Nami, Chopper in Sanji, Franky in Chopper, Nami in Franky, Tashigi in Smoker, Smoker in Tashigi, Caesar Clown, Monet, Vergo, Caesar’s henchman. There is also a secret…I wonder that that is. アニキャラヒーローズ ワンピースVol.14 パンクハザード編 ラインナップ：ルフィ、トラファルガー・ロー、スモーカー、錦えもん、ナミ（サンジ）、サンジ（チョッパー）、チョッパー（フランキー）、フランキー（ナミ）、スモーカー（たしぎ）、たしぎ（スモーカー）、シーザー・クラウンＡ、シーザー・クラウンＢ、モネ、ヴェルゴ、シーザー兵。後もう一つはシークレットです。シークレットが何か気になりますね。 Looking for One Piece Mini Big Head Figure Vol. 14? ONE PIECE Collection Punk Hazard Shambles Thanks to Law, we have Nami, Sanji, Chopper, Franky, Smoker and Tashigi with their bodies and hearts swapped. 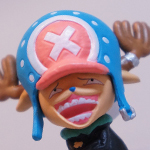 My favourite is Franky in Chopper. 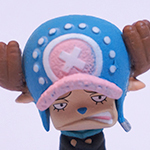 I hope they make more figures of Franky in Chopper!!! ワンピースコレクション　パンクハザードシャンブルズ。 ローの仕業でナミ、サンジ、チョッパー、フランキー、スモーカとたしぎの精神と体が入れ替わってしまった。 お気に入りは「フランキー(体はチョッパー)」です！！！ もっとフランキー チョッパーのフィギュアを作って欲しいな。 Looking for ONE PIECE Collection Punk Hazard Shambles? 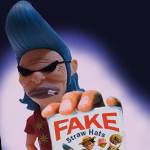 Fake Franky – Fake Straw Hat Pirates Photo #3 Who is fake Franky copying now? 偽フランキーは誰をマネしていますか？ Looking for Fake Franky? 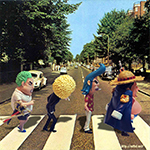 Record graphics – Fake Straw Hat Pirates Photo #2 Record graphics – Who’s song are the Fake Straw Hats copying? 偽麦わらの一味は誰の曲をマネしているんですかね？ Looking for the answer? 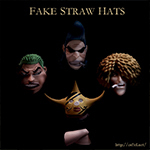 Fake Straw Hat Pirates Photo #1 A scoop photo of the fake straw hat pirates just came in!!! Where are they? 偽麦わらの一味の目撃写真が入りました！！！ ここはどこ？ Looking for the answer? WCF 25 – World Collectable Figure Vol. 25 WCF 25 – Usopp, Sanji, Nami and Zoro with their fake versions! Can you spot the difference? If you look closely, fake Zoro is wearing school indoor shoes!!! ウソップ・サンジ・ナミ・ゾロとそれぞれの偽物バージョンです！ 本物と偽物の違いがお分かりでしょうか？ 偽物ゾロは上履きを履いています！！！ Looking for World Collectable Figure Vol. 25?